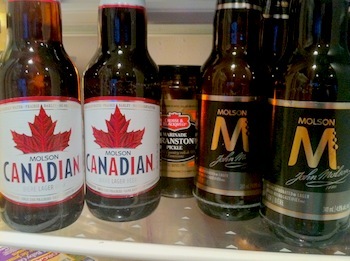 Last week I called out Molson for launching yet another marketing campaign disguised as a beer, “Molson M.” I even included an honest offer to review their beers and post the results here. Well, damn, turns out they have a marketing department that reads random internet blogs about beer, and very specifically my random internet blog about beer. As a result, I was contacted by their Director of Communications and offered a chance to sample their new product. Not being a beer geek who goes against his word, I asked them for enough of both Canadian and M to do a sampling for 3-4 people. Two 12 packs showed up the next day at my office. I suspect Molson samples beer a bit differently than I do. With the beer itself came the Molson M press kit which, as you’ve probably already guessed, contains exactly zero information about the beer that isn’t already online at their website, which itself contains very scant intel. From my email conversation with Adam Moffat (said Director of Communications), it became pretty clear that Molson aims to guard any and all details about what goes into their product, or how it’s made, as closely as a state secret. Beyond that, though, I’m going in blind. With 12 of each beer to sample I’ve decided to split things up into a few tests and reveal the results here in separate posts. This is half to avoid an overwhelming dump of info on the site, and half because these Molson-based posts get a LOT of traffic, and I am an insufferable attention whore. No really, I will do absolutely unspeakable things if you’ll hang out with me. Please? The first of these tests will commence this evening, if only to make some extra room in my fridge for good beer. A 4 person double-blind taste test of Canadian, M, Central City Lager, and some club soda I have strained through an old dirty sock. The exact same test, but with carbonation between all four products equalized (likely at ~9psi). This will help determine if M’s gimmick is literally just less carbonation. A series of lab tests, intending to determine sugar content, raw carbonation, and a few other variables. Yes, I have access to a lab. 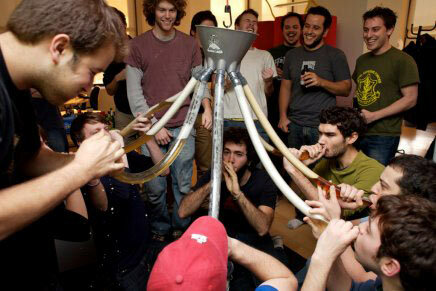 Yes, I call it the Beer Cave. The exact nature of these experiments will be determined by the delay between a window breaking and the cops showing up, and whether or not they get faster or slower with repeated events. All told, you can likely expect me to prattle on about all this shiite for some time, so it’s probably best to tune out for a week or so if you’d prefer. By then, I should be back to posting about beer that you might actually want to drink. * No, not really. Branston Pickle is damned tasty. So good, in fact, that I use a person’s feelings towards it as a basis for concrete character judgements. Subscribe to comments with RSS or TrackBack to 'Be Careful What You Wish For'. I have the beer aging article from Journal of Agricultural and Food Chemistry; how do I email it to Barley Mowat? Sent you an email but maybe you didn’t get it. Send that baby to hallett [at] g mail [dot] com.